I caught up with the freelance illustrator known as Jotaká who I’ve been following for a long time and asked him a couple of questions about his fantastic illustrations and life in Valencia for Match-up Mag. He also created series of paper family portraits by rendering his characters in cut paper. When I asked him the meaning of the illustration, “just wanted to put a smile on the people faces” he said. To know more about him, keep going to read the rest of the interview. Enjoy it! Hello Juan, Could you start out by telling who you are and what you are doing? My real name is Juan Carlos, and I live in Valencia, a Mediterranean city located in the eastern region of Spain. 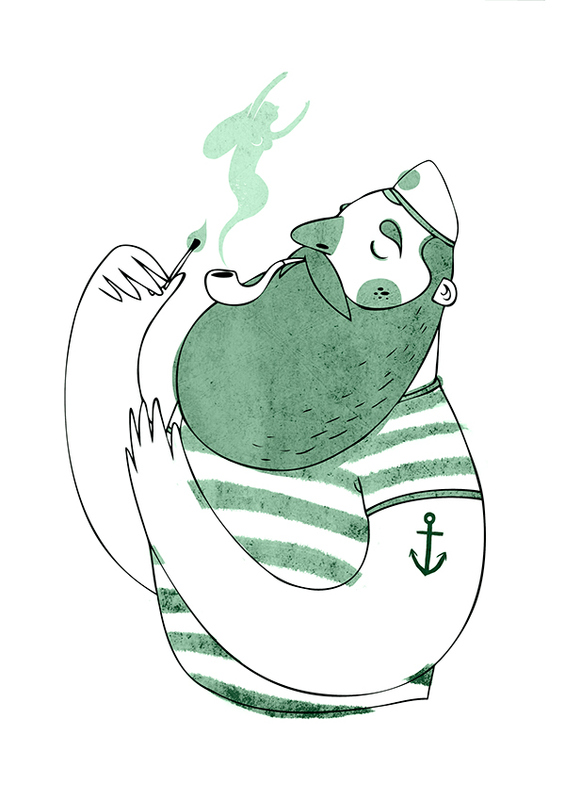 I’m working as a freelance illustrator and I’m completely in love with my job. My hobbies outside of drawing are taking photos, traveling, collecting things that inspire me and laughing as much as possible. What is the story behind “Jotaká” name? My friends in college started calling me "JK" to shorten my name. In Spanish, that sounds like "Jotaká," literally. The unique name has definitely been helpful in creating my own brand as an artist. I started drawing when I was really small and never stopped. I began attending an art academy when I was just five years old. There, I gradually discovered that I enjoy doing creative things. Even later, when I was in high school, I would fill my agendas and notebooks with drawings. When I was 18, I went on to study fine arts, and then illustration, in Valencia and Barcelona. Pretty much anything in everyday life, the simple things, inspire me. To illustrate- What does it mean for you? Even for me, it's difficult to describe my drawing style. I try to draw friendly and kind characters that make you smile. I attempt to give them a novel air but personalities that just about anyone can identify with. I really like to use powerful, happy colors. 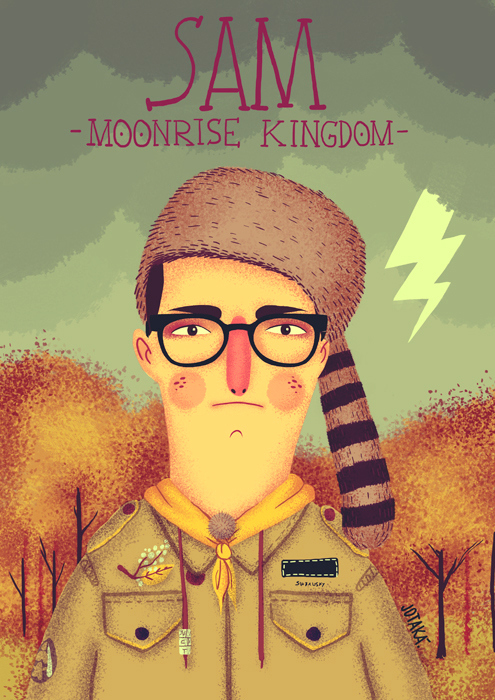 The first time I saw your illustrations of Wes Anderson’s character, I wanted to know you more. Could you tell us the story between your illustrations and Wes Anderson character? Wes Anderson is the person that most inspires me. His films, color palettes, characters, ALL is awesome, he’s a genius! I’m inspired by a lot of things like movies, posters, internet, social networks, my own city and others walking around the streets... all is inspirational. Please, Tell us about your collection “Scourge of the Sea”. How did you start with? Since childhood, I've always been interested in everything related to pirates. The treasure islands and characters I imagined while playing with my toy pirate boat were just so "drawable." This collection definitely reminds me of my childhood. To create this collection, I first drew some freeform sketches without thinking too much about what I wanted to draw. I then picked a few sketches that looked appropriate and cleaned them up with ink and markers. Then, I colored them in digitally. The whole collection took about a month to create, though I discarded many of the images because they did not match what I had in mind. I had such a great time making them! I would like to know more about your series of paper family portraits. How do you describe the images? The best thing about “la siesta” is being in a company, hugging that special person, your pets, or being surrounded by any object that truly identifies your personality (a vinyl, a camera, etc.). That context and that hug create a magnetic force, which make you smile till you fall asleep, like characters do in “la siesta”. I like to draw moments like this. I lived in Valencia for a while and really loved. So, could you tell which is the most beautiful and inspirational thing about Valencia? I think the most inspirational thing about Valencia is the people, very openminded and funny as well. I invite to all the people to our amazing festivity in march (Fallas), is very creative and amazing.